"Ninja" redirects here. For other uses, see Ninja (disambiguation). The Ninja Mouse is attracted mainly to Standard Cheese in the Mountain, Training Grounds, and Dojo locations. In the Mountain location, the Ninja Mouse will also be attracted when hunting with White Cheddar Cheese, but is not attracted when hunting with Chedd-Ore Cheese or Abominable Asiago Cheese. In the Dojo location, the Ninja Mouse will also be attracted when hunting with Maki Cheese. No Charms are required to attract the Ninja Mouse. Hunters can encounter the Ninja Mouse in the Mountain, Training Grounds, and Dojo locations. 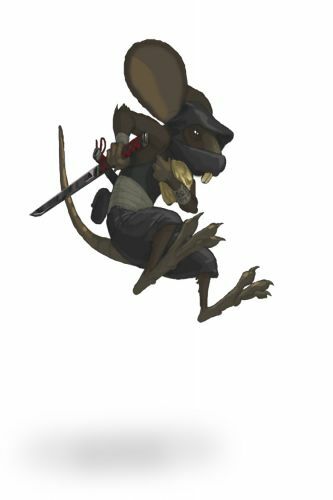 The Ninja Mouse is not known to drop any loot in the Mountain, Training Grounds, or Dojo locations. Attraction info and special event loot drops for the Ninja Mouse can be found at the individual event location pages. The Ninja Mouse, when caught in the Mountain, drops the Gnawnia Egg during the annual Spring Egg Hunt. Known for its extreme rarity, speed and intelligence the ninja mouse is one of the most challenging mice to catch. A hunter will learn much from catching such a cunning foe and is therefore worth a bundle of points. 14 April 2011: The Ninja Mouse began dropping the Green Plaid Egg in the Training Grounds as part of the Spring Egg Hunt 2011 event. 16 April 2011: The Ninja Mouse began dropping the Blue Argyle Egg in the Dojo as part of the Spring Egg Hunt 2011 event. 7 November 2017: The Ninja Mouse stopped dropping the Laboratory Map Piece as loot. This page was last edited on 21 September 2018, at 17:17.